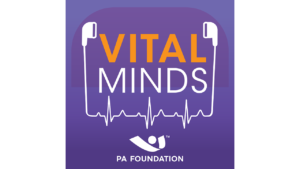 Vital Minds is a podcast of the PA Foundation, a national nonprofit organization that promotes better health and wellness by providing PAs and PA students with philanthropic opportunities and resources. Each Vital Minds episode features a conversation between host James Millward, an early career PA, and a guest expert on a topic of relevance to the PA and healthcare provider audience, ranging from mental health to obesity to pain management and many more. This episode of Vital Minds is a collaborative effort between the nccPA Health Foundation and the PA Foundation and is part of the PArtners in Mental Health Initiative. This initiative leverages a collective impact change strategy to improve the nation’s health by advancing the roles of PAs and strengthening partnerships to address issues impacting mental health and substance use disorders. Achieving that goal means encouraging us, as PAs, to care for ourselves and one another so we’re the best that we can be for our patients.